Along with when the cache was found, check the comments for other feedback about how difficult the cache was. 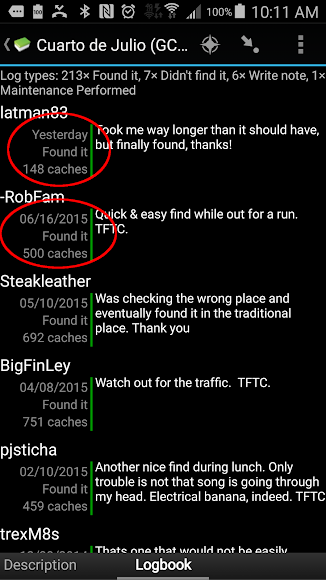 Though, don't read too much into any of this: I've been totally stumped on caches that others flagged as a "quick find." 2. Avoid caches that are surrounded by public activity. It's tempting to try finding caches that are close to home, say near a shopping center you park frequent all the time. The thing is, these caches survive because they are extremely well hidden. That's not to say you shouldn't try for them, I just wouldn't make them my first set of attempts. Our most recent treasure hunting expedition took us to Potomac Overlook Park and accessing the cache required hiking a couple hundred yards. This led to a cache that was kid friendly, requiring that you do little more than look under a log. This only works because the foot traffic through this was infrequent. 3. The GPS will get you close by, your geosense will get you the rest of the way there. 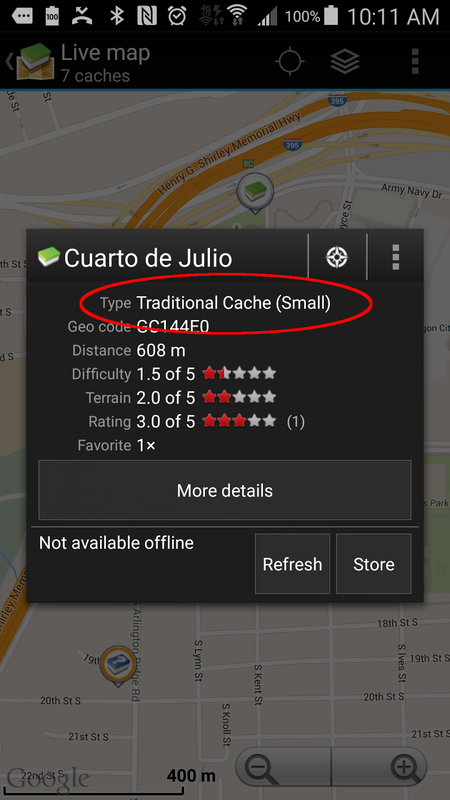 To geocache, you'll need an app on your phone. I use c:geo on Android and it works well. 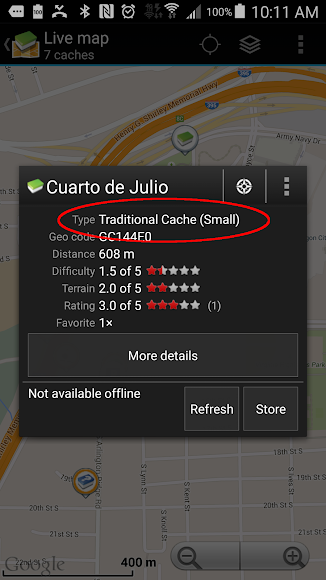 Regardless of the app you use, the GPS on your phone will get you close to the cache itself. But it won't do all the work. Once you're in the neighborhood of the cache, you've got to use your other senses. The general strategy I use is to look for anything that seems out of place. Does that large rock seem like it belongs? Or why is that big chunk of bark leaning against the tree, just so. Another strategy: where would I hide something if I were looking to stash something in this area? Is there a hallow in the log or tree that would be a perfect hiding place? Don't forget to check the hint on the geocache entry and read the comments. More than anything else, just look for something that's just not right. 5. Practice a take one, leave one, policy. When we do find a cache, I strive to always leave something if we plan to take something. So make sure you head out caching with a couple of goodies on your person. It doesn't need to be anything remotely fancy. I've left stickers, Play-Doh, coins (both foreign and domestic) and even a p51 can opener. The treasure we've found has never been worth more than a few cents. But it's treasure none the less, and the kids who we've gone geocaching with have treated the eraser, playmobile figure or coin for a foreign land as though it was as precious as can be. Ultimately, not finding a cache is part of the experienc too and does make finally finding a cache all the sweeter. It took me at least three geocaching attempts before I finally found one, so don't be shocked if the same happens to you (though, I didn't follow the above advice). So what are you waiting for? Sign up for the free membership over at geocaching.com, install the app on your phone, and go treasure hunting today!